Plumeria plants, which are also known as Lei Flowers and Frangipani, are actually small trees that are native to tropical regions. The flowers of these beautiful plants are used in making traditional Hawaiian leis. They are highly fragrant and bloom freely from spring throughout fall in multiple colors like white, yellow, pink, and red. These flowers stand out nicely amid the large-leaved foliage, which may be evergreen or deciduous, depending on the type. 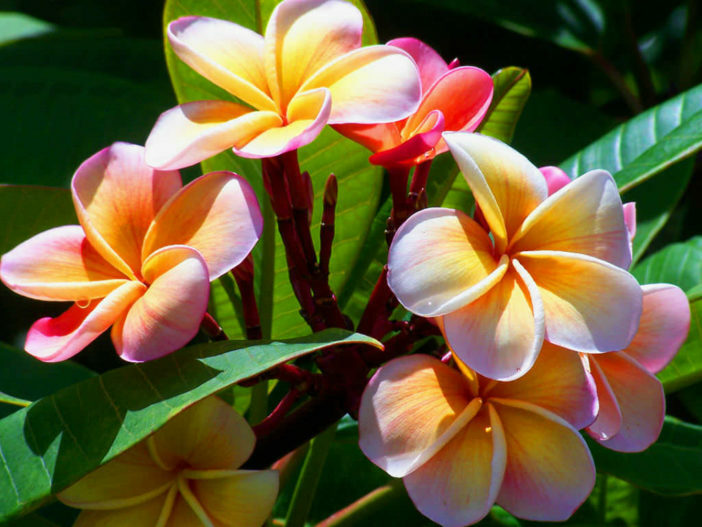 Although you don’t have to live in the tropics to grow Plumeria in the home garden, you should be aware of its growing requirements beforehand. Often grown in the garden as an ornamental shrub or small tree, Plumeria plants need to be grown in well-draining soil that is slightly acidic. They also need at least six hours of full sun. While the plants are fairly tolerant of both salt and windy conditions, they’re not tolerant of cold and must be protected. Therefore, they should be container grown in colder regions. In areas that may be warm most of the time but still fairly prone to cold winters, the plant can be dug up and overwintered indoors. Alternatively, you can sink container grown Plumerias in the ground, bringing them indoors once the temperatures begin to drop in fall. Once warmer temps return in spring, you can return the plants back outdoors. When growing Plumeria plants in pots, use a coarse, well-draining potting mix. Cactus mix or perlite and sand should be fine. Plumeria care, for the most part, is minimal. While Plumerias don’t like wet feet, they should be watered deeply when irrigated and then allowed to dry out some before watering again. They also need to be fertilized about every two to three weeks throughout their active growing season. Reduce watering in mid fall and stop completely once the plants enter dormancy in winter. Resume regular watering as new growth appears in spring. A high phosphate (phosphorus) fertilizer, like 10-30-10, will help encourage blooms. Giving them too much nitrogen will only result in more foliage growth and less flowering. Plumerias may be pruned as needed (up to 12 inches from ground) in late winter or early spring (prior to new growth); however, any drastic or hard pruning done may reduce flowering. These plants can also be propagated by seeds or cuttings in spring, with cuttings being the easiest and most preferred method. Insert cuttings about 2 inches in potting mix and water thoroughly.